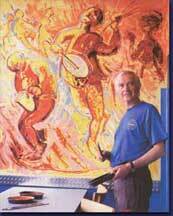 Sigmund Aarseth was instrumental in bringing attention to Norwegian Rosemaling to America in the 1960's and his classes in Decorah, Iowa were an impetus to the Rosemaling movement in America. His classes and earlier book have inspired countless Rosemalers worldwide. His style of Telemark Rosemaling is unique and beautiful, vibrant with color and energy.